To anyone who watched the GI Joe cartoon in the '80s, it should come as no surprise that Cobra Commander featured in the most episodes and had the most lines. But you might not expect that the person who comes in right behind him is the Joe team's Covert Ops specialist, Lady Jaye. Lady Jaye graduated from Bryn Mawr and did her graduate work at Trinity College in Dublin where she acquired the faint Gaelic lilt that adorns her speech. An accomplished actress and mime as well as a studied linguist, she can easily pass as a native in France, Italy, Poland, Russia, Germany, Afghanistan, Spain, and Portugal. Airborne and Ranger qualified, graduated intelligence school Fort Holabird. Qualified expert: M-16, M1911A1 and reflex crossbow. 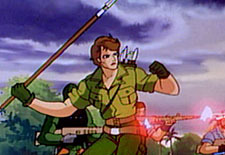 As the GI Joe franchise ages, some things really begin to stick out as anachronisms. Snake-Eyes, Storm Shadow and Stalker all being active in the Vietnam war is just one of the blatant examples, but there are many more that are easier to overlook. For instance, in Lady Jaye's filecard info up there? It says she graduated the intelligence school at Fort Holabird. The intelligence school at Fort Holabird was closed and transfered to Arizona's Fort Huachuca in 1971; that may have been fine in the '80s, but today it means she had to graduate nearly 40 years ago. She's looking pretty spry for her age. Series 1 of the individually carded TFAC figures was made entirely from bodies re-used from the boxed sets, but Series 2 finally introduces some new sculpts: in other words, Lady Jaye isn't just a fancy repaint of Scarlett. Her outfit is one of the more "military" designs in the series, since she's basically just wearing standard boots, green fatigues, web gear, gloves and a hat. There's a knife sheathed on her right boot, and a Derringer holstered on her left, but they're both molded pieces of the figure's leg; they duplicate elements that were sculpted onto the original figure, too. She'd look right at home on any random army base, unlike a lot of her teammates. She should probably zip up, but you don't hear anyone complaining about that. The figure's face doesn't really look like the painting on the card - but then, the 1985 version didn't, either. In the artwork, she looks very angular and stern; the figure seems much younger. Admittedly, the stern patrician facade suits someone born on Martha's Vineyard, but I have to admit I like the softer features on the toy. In either case, she defied '80s cartoon gender stereotypes by rocking short hair: yes, the original toys of Scarlett and Cover Girl also had short hair, but that was due to the limits of toymaking, not actual character design. Like Flint, Lady Jaye is a perfect candidate for a cartoon-based variant. The major difference between the figure and the cartoon, of course, is that the animated version never wore a hat, but there's more than that. Her pants and gloves would be dark green, her boots would be brown, and there'd be a knife strapped to her chest. Oh, and she'd come with a quiver full of javelins, too, since that was her inexplicable weapon of choice. I think we're really on to something, here! Cartoon variants. Get on it, Hasbro. Speaking of weapons, Lady Jaye's gear is an updated version of the original figure's accessories. Her main weapon is a "power javelin" (whatever that is), which is brown and silver, rather than the solid gray of the original. It's still a weird bit of ordinance. She also has a highly detailed backpack which slips onto her shoulders, rather than plugging into her back (though she does have a hole back there). She has a free-floating (non-removable) belt with a working holster on the left hip. Actually, you have to wonder: is Lady Jaye left-handed? Lady Jaye's articulation is very nice. She has a balljointed head, shoulders, elbows, torso, hips and ankles, plus double-hinged knees. She doesn't have any wrists, despite wearing gloves that would provide a natural seam. And I don't know if this is a problem with all the Lady Jaye figures or just mine, but the right thigh tends to come apart above the knee when the figure is moved; it's not enough to make the figure fall apart or even make it loose (far from it, in fact), it's just an asthetic concern, and it pushes back together easily. Most of the Joe and Cobra troopers have codenames that make some kind of sense - you may not know how "snake eyes" relates to a caucasian ninja, but you know what the phrase means. But, Lady Jaye? What does that mean? When she first appeared in issue 32 of the Marvel comic, she was identified only as "Lady J," so maybe it's supposed to be a phoenetic spelling of the letter? That still leaves the question of what the J stands for. Well, we asked Devil's Due Publishing, the folks behind the current GI Joe comic, if they knew the answer; they were kind enough to take the question directly to Larry Hama, who was the guiding force of the comics and filecards in the '80s. The official word? He was going to call her "Lady Shay" or "Lady Shea," but changed it in honor of the wife of Jay Bacal, son of the co-founder of Griffin Bacal, the ad agency that had the Hasbro account for years and founded Sunbow Productions (the company that did the cartoon, naturally). Still, that linguistic oddity hasn't kept her from becoming one of the most popular Joes, and doesn't keep this figure from being a good representation.